When you sell a second hand car, motorbike or other vehicle through private sales it is critical that you agree the terms of the sale and purchase with the buyer in writing. Documenting the agreement and the state of the used car prevents the buyer from later claiming that you misled him as to the condition and demanding his money back. The AA recommends that you use a written agreement and goes as far as producing a free sample download. However, the AA version (and many of the free versions on the Internet), in our opinion, doesn’t go far enough to document the car or the legal agreement. The Net Lawman version, while not free, is far more comprehensive and thus protects both parties far more greatly. 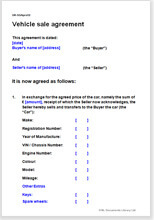 To use this agreement, complete as many details in advance as possible (the template is in Microsoft Word format) and then print two copies, one for you and one for the other party. Complete the remainder of the form in front of the other party. Both parties should sign both copies and keep them as proof of sale. "I have used netlawman for over 3 years, and have always found the legal agreements I need are excellent, for my own company and my clients. Their prices are lower than most, and their website is really easy to use. I would recommend them to everyone." Apex Accountancy & Tax Services Ltd.